M63 is a beautiful spiral galaxy and is part of a group of galaxies dominated by M51, the Whirlpool Galaxy. The galaxy sports amazing details in its rather undefined spiral arms. Because it lacks traditional spiral arms, it belongs to a class of galaxies known as flocculent spiral galaxies. This image also contains numerous background galaxies. 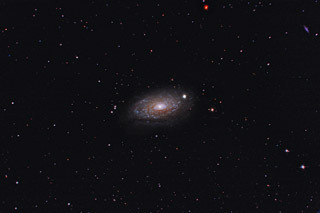 The irregular galaxy next to M63 at about the 4 o'clock position is UGCA 342 and the bright edge on barred spiral galaxy in the upper right corner is UGC 08313. This image shows galaxies as faint as magnitude 19.4. In this image, North is Up. This image is cropped to 69% of the original full frame. Software Used Images Plus 4.5 for camera control, calibration, stacking, digital development, deconvolution, multiresolution sharpening, smoothing and noise reduction. Photoshop CS5 used for levels and curves, color balance, high pass filter, star shrinking, saturation adjustments, screen mask invert, and smart sharpen. Gradient Xterminator for gradient removal. Carboni Tools for additional saturation adjustments, noise reduction, and smoothing. HLVG for additional color correction. Notes I had imaged M63 last year before I was able to autoguide. I had a decent image, but I knew that I could improve upon it. I had some very good conditions the two nights I photographed M63 this year, and am very glad that I was able to pull out some nice, fine details from this very complex galaxy. This image was published by Astronomy Magazine as its Picture of the Day for February 6, 2017!